Bwlch Pen Barras at Moel Famau / Clwydian Range (NRW)0300 065 3000work Car ParkThis car park has fabulous views of the Vale of Clwyd and is a great starting point for walks. The path to the Jubilee Tower at the summit of Moel Famau is the most popular, while the shorter but steeper trail to Moel Fenlli is crowned with an iron age hillfort. This trail is a short, steep climb to the summit and one of the most impressive Iron Age Hillforts in the Clwydian Range. The path returns to the car park around the lower ramparts. This trail climbs steeply but steadily to the Jubilee Tower at the top of Moel Famau and returns through mixed forest or open countryside. Moel Famau is the highest summit in the Clwydian Range (554 metres/1818 feet) and offers one of most spectacular views in Wales. This circular walk takes you around the lower ramparts of Moel Fenlli and on through farmland. It returns along the slopes of Fron Hen and through attractive mixed forest. This trail is a steady climb to the Jubilee Tower at the top of Moel Famau. The trail returns through open countryside and skirts Moel y Gaer and its fascinating Iron Age hillfort. From Mold take the A494. Follow this road through the towns of Gwernymynydd and Loggerheads, until you come to a junction with 'Moel Famau Country Park' signposted to the right. Follow this road for 1 1/2 miles past Coed Moel Famau up to the top of the hill. From Ruthin take the A494 towards Mold. After passing through the village of Llanferres you will see a junction with 'Moel Famau Country Park' signposted on the left. Follow this road for 1 mile, you will see the car park on your right hand side. Follow this road for 1 1/2 miles past Coed Moel Famau up to the top of the hill. 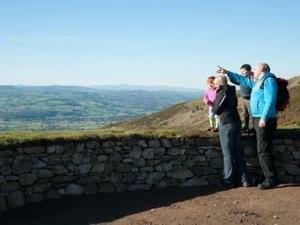 This car park has fabulous views of the Vale of Clwyd and is a great starting point for walks. The path to the Jubilee Tower at the summit of Moel Famau is the most popular, while the shorter but steeper trail to Moel Fenlli is crowned with an iron age hillfort.